It has come to an end… finally! My husband and I started the kids playhouse plans when our oldest (who turned 4 on Friday) was still in the womb, seriously. While building our home I couldn’t stand to see all the snippets (what most would call garbage) go to the dump or be used as kindling, so I made hubby stash them in our crawl space until one day our youngsters would need a kick-@ss place to escape. Last year we (I mean mostly him and our awesome neighbour) drug the supplies out and built this cute little palace. The playhouse was built to resemble our actual home. Welcome inside, have a sip of tea, relax on the sofa, or sleepover in the loft! 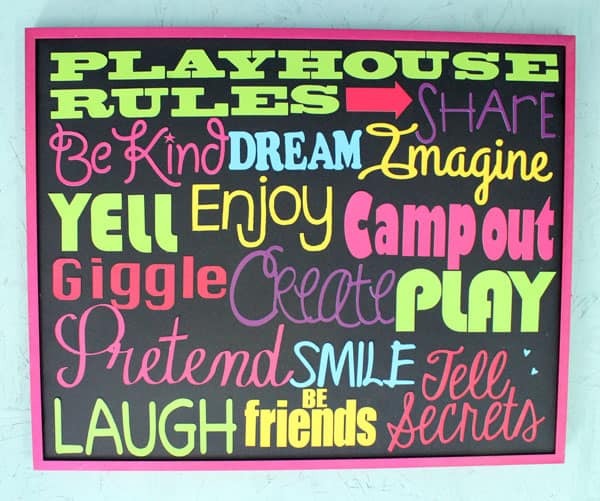 I created this word art with my Silhouette and Xyron, all the fun things I want the playhouse to be. The end of the playhouse (which faces the woods) has full length doors. The kids often play with them open when the weather is nice. In the winter we can use the building to store larger items like the lawn mower, bikes, and summer toys. When the kids are grown it can just be used as a shed. I added some cushion and reupholstered the foot stool to make a sofa. The curtains I made with thrift store fabric and added cute ribbon details with May Arts Ric-Rac and yellow chevron twill. 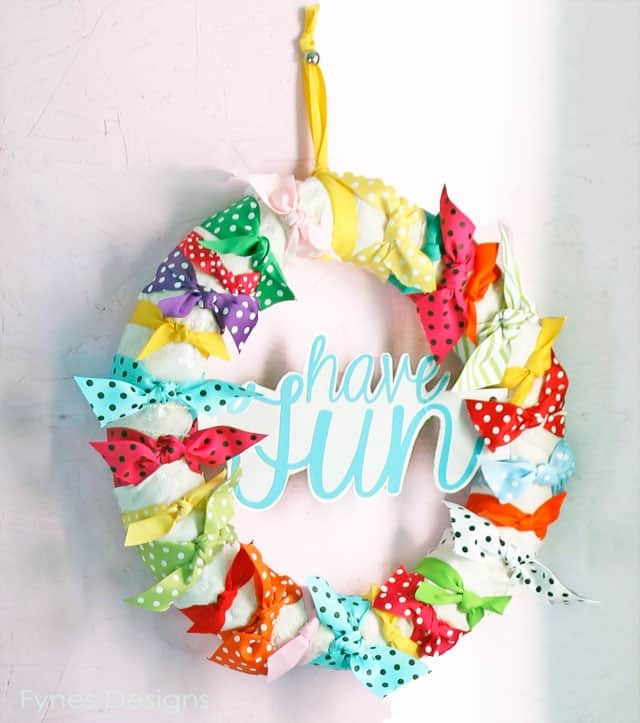 The ‘have fun’ wreath was made with a collection of May Arts Grosgrain polka dot ribbons. Cute and simple, and easy to make! I picked up this end table at a thrift shop for $3! The blue chair was my husbands when he was small. I snagged the chalkboard for $2. Isn’t that vintage Tupperware set the cutest? I made the bunting from scrap fabric, May Arts Ric-Rac, and a few scraps of May Arts twill (blue twill below too). Come on upstairs into the Kid Cave. This is where we can have sleepovers and put the babies for a rest. Pop your head out the hole and have a look below! What did you think of my kids playhouse, want to come over and play? Now for the Giant giveaway… Yesterday May Arts revealed a shiny NEW website!! They are celebrating their grand re-opening with this blog hop and giving away $1000 worth of crafty goodness from many awesome sponsors! All the best, and hope the kidlets enjoy their new digs! This is a kid’s dream come true! You are an amazing mom… and designer! Never before have I seen a ‘play house’ like this! Amazing is an understatement…. Holy Playhouse!, That’s a guest cottage! Absolutely stunning, great job! WOW – what an awesome playhouse Virginia – it looks fabulous inside and out and was well worth the years of “preparation time” and very hard work!!! What a wonderful playhouse. The curtains are simply adorable! So many details that take it from ordinary to outstanding! Virginia, that playhouse is amazing! You are so talented. 🙂 Love the giveaway, too. You just never know what you’ll find on your blog! Love it! Beautiful playhouse!! And a wonderful blog!! I’m a new follower! Thanks for stopping by, and joining in on the fun Amy! Now that is a cool playhouse! I bet the kids love it. Virginia *I* would never leave!!!!!! SO amazing!! A-MAZ-ing playhouse and love all the different ways you used ribbon!! Amazing. The play house is just the cutest thing ever and I love all the ribbon touches. Oh, my! This is just too, too cute for words. Your kids are very lucky to have such a great playhouse. I love all of the ribbon touches – especially love the polka dot ribbons!! I love the playhouse! Lots of great ideas. Thank you for the giveaway too! Those are the luckiest kids in the world! They will cherish that playhouse for years to come! Great job! And what a good “Daddy”! Incredible Virginia! You definitely out did yourself on this one! Wish I was your kid! 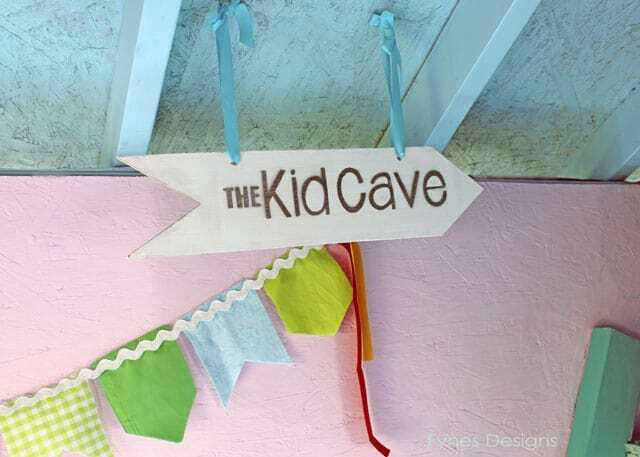 Love the kids cave! 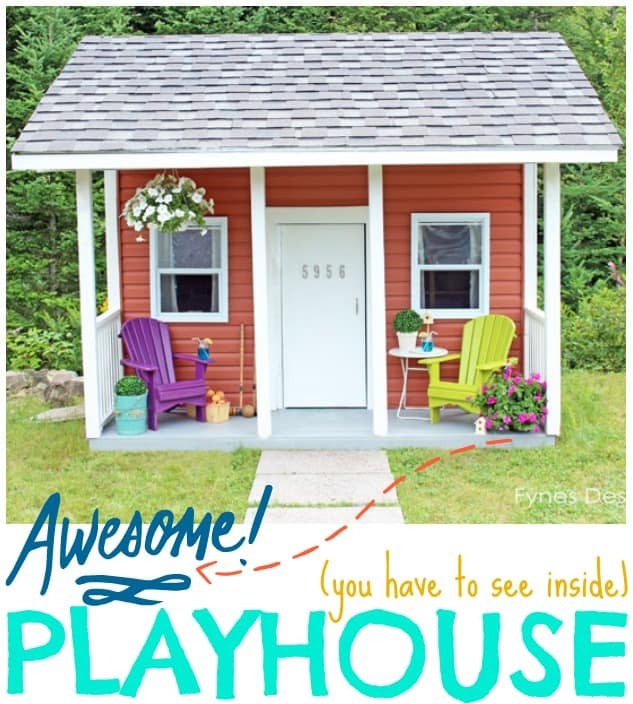 What a fun playhouse and I love how you used ribbon to decorate it. Oh my.. Their lil playhouse is adorable. I love all your cute projects inside. the ribbon cutting is so darn cute. OMG ! That playhouse is AMAZING !!!!!! Love that you did an actual ribbon cutting. So cute. This is over-the-top wonderful!! What blessed children you have! Just looking at the photos turns me into a little girl again, filled with wonder and delight at such a magical place! I love the playhouse. I wouldn’t mind living there. It’s just the right size. So sweet, and so are the kids. Once again, you have outdone yourself. Wow – that is just amazing! What an amazing playhouse, and I love the colour scheme. Definitely a fun place to hang out! What a playhouse this is. Amazing!! I’ll bet your kids absolutely love it. Thanks for all the ideas. Virginia- the play house is awesome! They are going to get hours and hours of summer fun in there. Love it! Holy cow, I would have loved this as a kid!!! Just amazing and that you did a ribbon cutting…too cute. This is the most adorable playhouse ever! I am so jealous of your kids! When can we come for a play date in this amazing house? LOVE every detail. Wow! That is a kids dream come true! And its so well decorated! Our kids had a playhouse, but we didn’t dress it up. Now I feel guilty 🙂 All of your projects were adorable! I love the wreath. WOW!! This Play House id AWESOME!!! Way to go,I know your kids are being enved,and loved all at the same time! Absolutely every kids dream….Gorgeous! Thanks for sharing! I would have been SO happy to have a playhouse like that (ok, I still would:) ). I like all of the different ways you used May Arts ribbon and fabric in it. Great job. WOW!! This is such an amazing playhouse, I want to move in!!! Everything is just perfect and you used the May Arts ribbon to perfection!! Oh, my! Isn’t this just any child’s dream come true! What a fabulous play house. You did a fabulous job decorating it. Love the curtains, the bunting… The thrift shop finds are perfect! Well done! 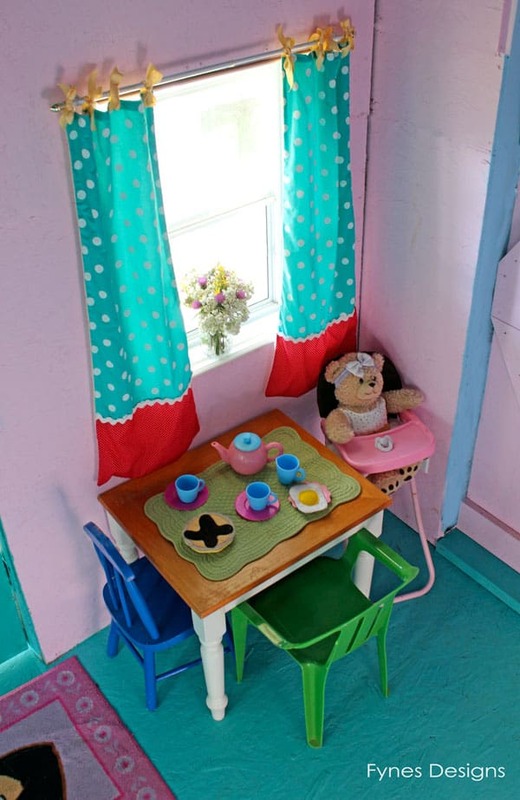 This playhouse is even cuter than my own home. Love all the extra touches and the colors are just fantastic. Wow! It’s so precious! Brought back great memories…grandpa built a custom playhouse for me. Grandpa’s taste in decor was a little different. ;-). Thanks for sharing. I absolutely love it! Can I come over and play? Seriously….that playhouse is the cutest. Your children are very lucky! What a project! I enjoyed reading how you plan to age up the use of this little building. Well done! What a GREAT playhouse!! Your kids are going to have a BLAST! Wow, way cool!!!!! What kid wouldn’t love the heck out of that?!! I want to come play!!! LOVE the house and all the May Arts touches! Wow!! 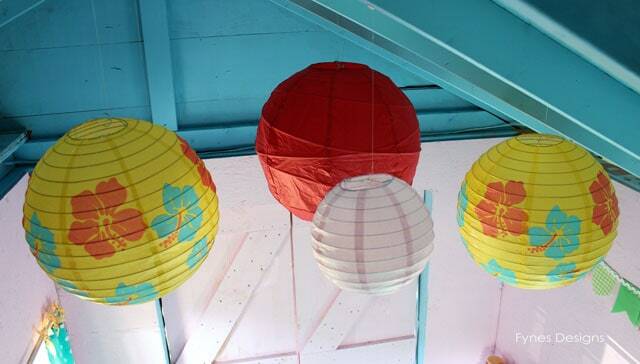 Awesome decorations for the childs playhouse!! I want that playhouse! That’s so clever to have a ribbon cutting ceremony for it. Love, love, love it!!! Wow that is the best looking playhouse I’ve ever seen. LOVE IT!!! Come over and play??? I want to come over and STAY! This is just the cutest!!! 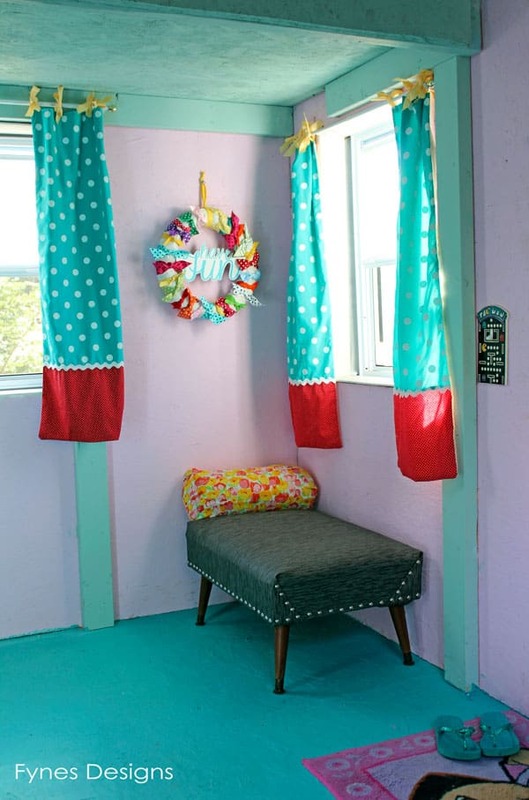 I LOVE how you used all the different ribbons to decorate and even as ties to hang the bright curtains! Maybe you can come decorate my place?!?! Wow! we’ll make space for you! Come on over! WOW . . . just WOW!!! The playhouse is A-M-A-Z-I-N-G!!! I am not sure who’s playhouse this is. Looks to me like you had a lot of fun playing with the ribbons and decorating inside. These are 2 lucky kids…. I can’t lie, I wanted them to have a playhouse, because I always wanted one.I had just as much fun creating for it! Looking for the ‘like’ button ~ your reply made me smile. Oh, my goodness! Can I come over to play?! What an adorable playhouse! I love it! OMG that playhouse is so awesome I want to hide in there!! Great giveaway also. Such an awesome playhouse! My grandkids would love that. This is simply amazing! Love your ribbon wreath and all your special little touches. This is amazing! I can only imagine the memories that will be made there. What a wonderful playhouse, love all the details. And the old mini tupperware was a great find for it. And with the large doors at the back no alterations will be needed if it ever becomes a storage or wood shed, which I doubt. This will be passed down the generations, what a treasure. Virginia- the play house is awesome! You did a fabulous job decorating! I am so glad that I checked to see the inside of your adorable playhouse. I’m sure that any child would love to have this. What a clever idea to have a ribbon cutting ceremony. Love, love, love this!! The most awesome playhouse ever! As for becoming a shed when they leave … I don’t think so … think Grandchildren! Fabulous project. Kudos to you, your hubby, and neighbor for a job well done. It sure puts my hubby’s “fabulous” sand box to shame. Years ago, though (try about 40), my children and my neighbor’s grandchildren had a blast playing in the big, sturdy sand box that Dad built. Likewise, your children will always have this great memory from their childhood. 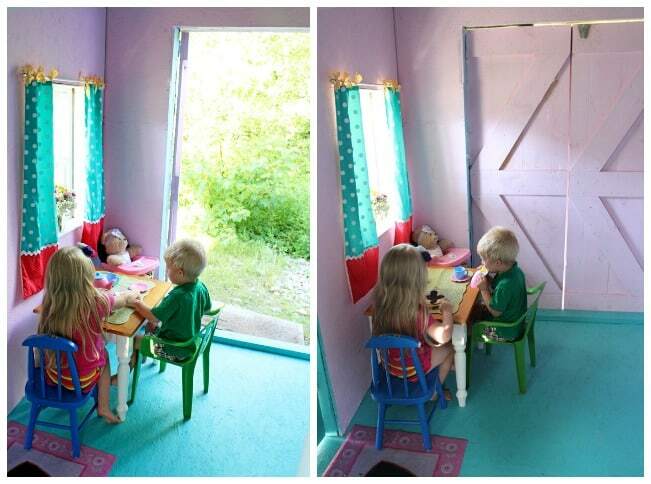 What a great playhouse for the kiddos; they have their own space. I hope they have many hours of play, creating, and goofing around in there. I want one for the kid in me…. I love the counter weight to make sure front door closes! Thanks Carol- I have to give credit to my hubs for that! Love your playhouse. It is a dream come true for any child. Phenomenal! I would love it for a playhouse!! Thanks for sharing. Ohmygosh, I love the playhouse. I have no children and live alone. I have a lot of nieces and nephews. I would so love to have that so when the kids come over they would have something to do. You did such a wonderful job building it and decorating it. Thank yo so much for sharing it. This is amazing! Kinda wishing my children were small again; they would have LOVED this! I want to come over and play and scrapbook with you, too. WOW! What a great playhouse and I love all the May Arts touches inside. Hope you get a chance to play and giggle in there with the kiddos. the playhouse is the cutest thing ever! i love it from the adorable curtains to the simple yet fun bow wreath…you did a fab job! WOW, Virgina.. I love it, it really couldn’t have turned out any nicer!! 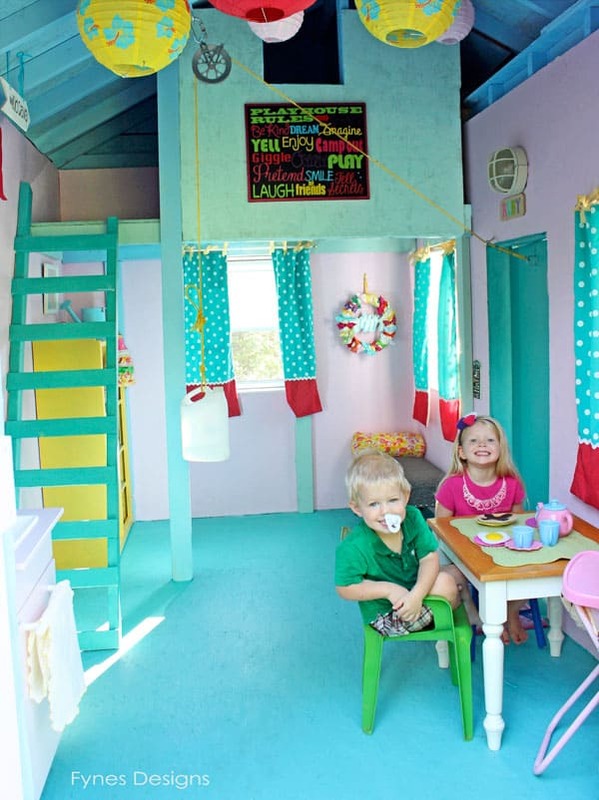 Oh my…I totally want a playhouse now… your projects are just amazing and so colorful!!! Goodness!!!! I want this playhouse in adult version!! 🙂 To have my own playhouse! My hubby would never see me! LOL Thank you for sharing! I love the rules and the wreath!! I am so jealous. I want this playhouse. You did an amazing job. Lucky kids. thanks for sharing. That is incredible and so nice a big, they will use it for ages. What an amazing playhouse – I have two little munchkins who would be blown away if they won this! I want something like this for our grandkids but no loft, maybe a small platform bed area. We have five and one on the way, and one of the 3 year olds is a bit on the mean side, she is usually good for me, but I have had to threaten a talk with Santa a time or two. Smart using full size doors and full size inside too. And I love the porch!! Lots of room inside for them to grow in, just too cute!! 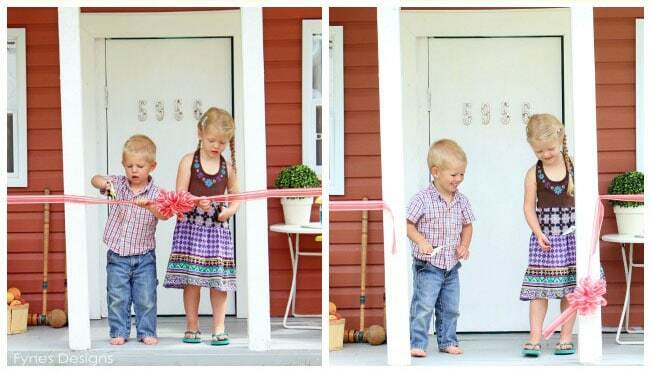 Grandkids ages girls- 6, 3, 3, 1 & boys- 2 and one to arrive late Oct.
Two fantastic ribbon cuttings at once. The little house is so cute. there will be a lot of years of fun and laughter coming from it. What are the dimensions of your playhouse? THe dimensions of the playhouse is 7 x 10, but we started with a 10 x 10 platform and a bit is used up by the deck area. I love it! Especially all the little details! We had that Tupperware play set when we were kids… and now our kids play with it at mom & dads! Awesome job on an awesome playhouse!! Thanks for stopping by Kendra, I love that little Tupperware set! Hi! I can’t tell you how much I have read, researched & studied your little playhouse! It’s absolutely perfect for my two little girls. My husband is very handy & is planning on building one in our backyard this summer. We are using yours as the “benchmark” for our design but keep searching for plans online we can base measurements off of. I know you are probably very busy & might not even read these comments anymore but thought it would be worth it to reach out just in case you do 🙂 did your husband have plans anywhere that he based his measurements/cuts off of? Would he be willing to email me? I would appreciate it so much any help you were willing to offer! 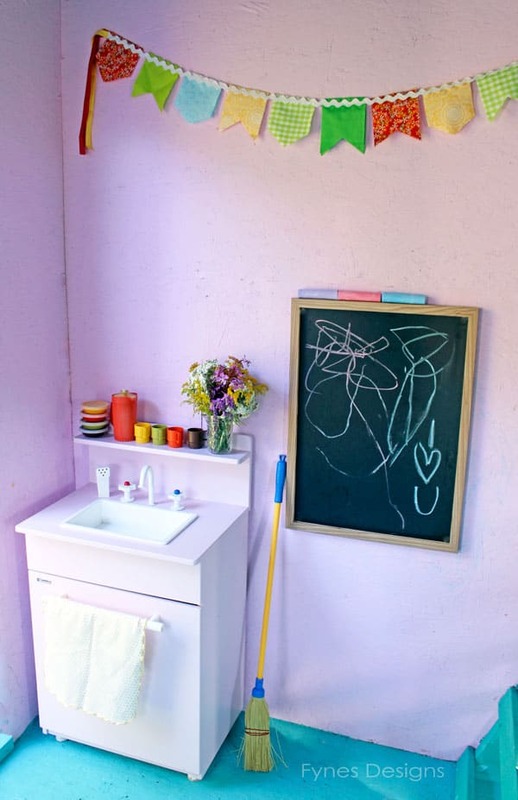 Thanks for reading this & kudos to your hubby for such a cute house & kudos to you for the adorable decorating 🙂 hope this summer brings lots of outdoor play for your littles! Hey Lauren, I’ll shoot you an email! Where did you find the little windows? It adds such a fun ‘real’ element to the playhouse! You can actually order shed windows that are made of plexi. We were worried about having glass windows incase they got broken. you never know what shenanigans kids would get into! I love your playhouse! 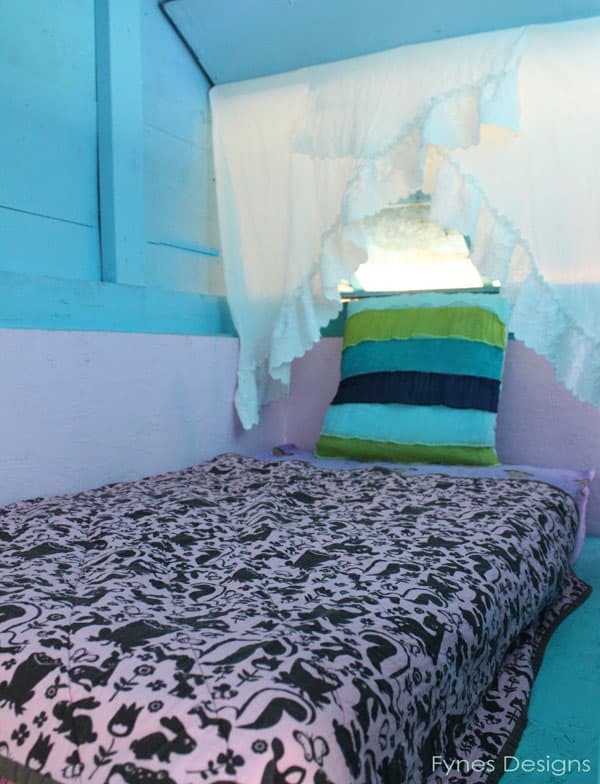 We are in the process for building one for my daughter and I had a quick question for you…we also have a loft and wanted to have a mattress/pillows/reading area. We live in NC and my husband is worried about the fabric getting mildew/mold. Would you share any tips to avoid this? Thanks in advance! It’s a beautifully decorated playhouse! I thought about that too. We have really cold winters, and the first year I left it out there and a squirrel made a nest in it. The next year we got a replacement and now we bring it in for the fall and winter. We haven’t had problems with mildew during the summer, now muddy hands and feet is a different story! Adorable ! Great job! At Christmas time I wanted to get a playhouse for our daughter but I had sticker shock! So I told myself that I would look for plans early on and then start trying to pick up scraps from building projects so we can tackle something like this before next Christmas! Do you have any plans or measurements that you would be willing to share?! Love what you have done!! ← In Bad Need of Closet Storage So I Gave it a Makeover!